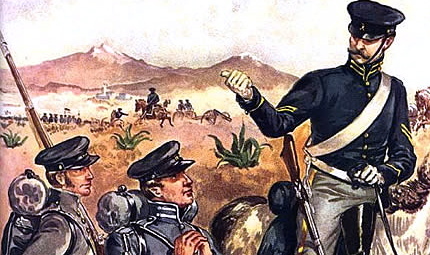 The typical Dragoon of the Mexican War era was a moving arsenal and military depot. Secured by a white buff leather sling over his left shoulder hung a .52 caliber Hall carbine a percussion breech-loading smooth-bore carbine of limited range and impact. In his pommel holster was a single shot Model 1836 flintlock horse pistol in .54 caliber. This foot-long weapon was wildly inaccurate and it was said, “practicing marksmanship it was never wise to choose for a mark anything smaller than a good sized barn.” From his buff belt was slung the Model 1833 saber. Troops complained that this saber would warp rubber-like around a man’s head and was only good for cutting warm butter. On his person was a cartridge box, a small pouch containing percussion caps, a haversack for rations, and a wooden canteen. Attempting to mount, while weighed down by all of this unwieldy equipage, could be a daunting task. As for the “genteel clothing” oft-mentioned in the recruiting advertisements, army regulations provided that for dress occasions the Dragoons wore a high collared coatee with a double row of nine brass buttons, trimmed in yellow, light blue kersey trousers, white belts, and a shiny black shako that sported a flowing white horsehair plume and yellow braid. 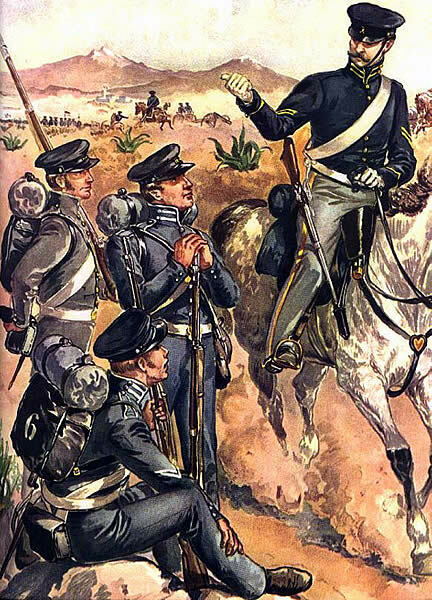 For fatigue duty, Dragoons wore the natty blue woolen shell jacket that was trimmed in yellow along with the Model 1839-pattern dark blue wool forage cap. In the warmer climes, sometimes the quartermaster would furnish fatigue uniforms made with white cotton duck cloth. 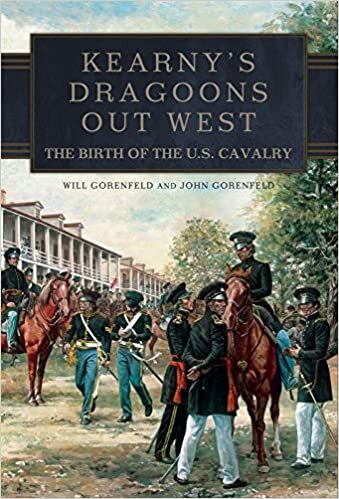 For post 1851 uniforms see “Dragoon Uniforms” infra.